Keeping as close as possible to the constraints facing cement manufacturers, Pyrocontrole has developed a comprehensive, specific range of temperature sensors which are reliable, rugged, dust-resistant, shockproof and capable of withstanding extreme temperatures. From milling through preheating of the meal, heating and cooling of the clinker to storage, our measuring instruments can guarantee safety on your installations and the quality of your production, as well as helping to reduce maintenance costs and energy spending. Pyrocontrole has developed a comprehensive offering of sensors for the cement manufacturing process, from milling through to storage. Discover what our know-how can do for your applications. Located near the bearing greasers and resistant to vibrations, this sensor checks the temperature of the bearing reliably and instantaneously. It can detect at an early stage any overheating which may lead to malfunctions. Installed to check the temperature of the gases, its rugged, compact design makes it highly resistant to shocks and vibrations. Its sensing element is protected by a stainless-steel sheath capable of withstanding corrosive gases. 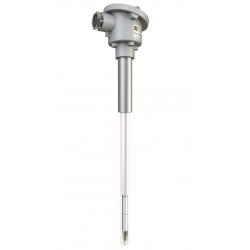 Used in discharge chimneys, this sensor measures and controls the temperature of the gases discharged into the atmosphere. In this way, it can be used to ensure correct operation of the installation and environmentally-friendly production. Installed upstream and downstream (discharge chute) of each cyclone, this sensor measures the bas and material temperatures. This monitoring helps to control and prevent any obstructions due to clogging of the fines. For the lower levels, the sensor is equipped with anti-abrasion protection. This rugged sensor withstands severe mechanical shocks. This sensor is capable of withstanding high temperatures and high concentrations of clinker dust. It monitors the temperature of the hot gases recovered from the rotary kiln and from the preheater tower. Immersed in the liquid fuel, this thermowell sensor is equipped with an interchangeable sensing element which avoids any loss of tightness on the installation and prevents shutdown and/or draining of the process. This sensor is qualified as ATEX / IECEx. Fixed onto the process by a flange, the ATEX / IECEx-qualified multi-point sensor comprises several probes of different lengths. This multi-point assembly makes it possible to gather enough information on the thermal gradation to map any overheating of the tank sufficiently quickly. Drawing on its expertise covering the whole thermal process chain, Pyrocontrole proposes temperature controllers and DIN-rail or sensor-head transmitters.